Vive le Champagne! 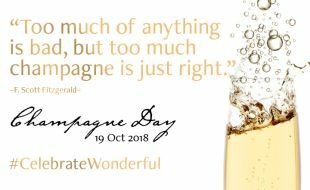 It’s time to titillate your taste buds with the bubbly sparkle and glorious taste of premium champagnes in a not-to-be-missed celebration of #ChampagneDay 2018 with Tsogo Sun. From 19 – 21 October 2018, champagne will flow from morning till late at select Tsogo Sun hotels where you can enjoy golden, white or pink bubbles in the ambience of one of our beautiful venues in Johannesburg, Cape Town and Durban. You can also enjoy Graham Beck Bliss Demi Sec or Graham Beck Brut for R250 at a fantastic buy-one-bottle-get-one-free special offer! Offer is valid from 11h00 on Friday, 19 October until 24h00 on 21 October 2018, and must be taken up during this period. The offer is only available at the above listed hotels. Champagne may not be purchased for offsite consumption. “Buy one bottle, get one free” offer is only valid for the same variant. This offer is not available at the Palazzo Hotel. Alcohol is not for sale to persons under the age of 18.